Want to hear an embarrassing, yet patriotic story? Ok…here it goes. When I was a little girl, my mom dressed me in nautical and Americana clothing…all the time. She loved it. She couldn’t get enough. At the time, it was all that the Limited Too was showing, which meant that it was all my mom was buying. Therefore, I went to 5th grade sporting American flags across my chest daily. It was fine. I didn’t mind. I hated fashion at the time (who woulda thought), so I wore whatever my mom made me wear. Don’t get me wrong…she usually dressed me cute, however the Americana themed clothing went a bit overboard. So much so, that the kids in school made fun of me. I was shy and hated being the center of attention. When it came time to say the Pledge of Allegiance, the kids would turn to me and say, “I pledge allegiance, to Hallie, of the United States of America…” I’m not so sure it even made sense, but the classroom of eyes staring at me, were enough to quickly switch my wardrobe. Back then, I wanted to cry. Of course today, I laugh as I recall the story. I found other ways to incorporate the colors into my wardrobe. 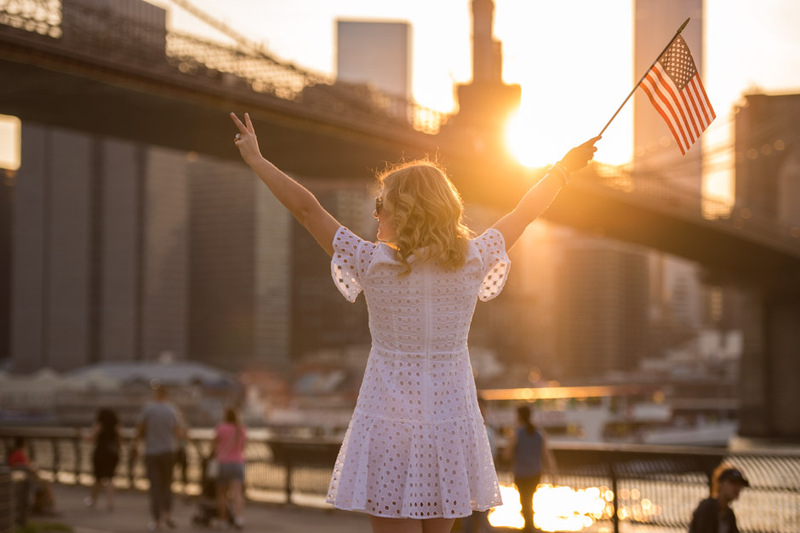 While of course, today I wouldn’t mind sporting patriotic clothing, I’m giving you a few other fun options to stylized your wardrobe for the Fourth. Aside from the typical symbolic American flag, you can add a few colors and textures to your look as well. Try white jeans or a skirt, mixed with navy and white stripes. Chambray or denim fabrics can also be great option when paired with white. You can add a pop of red with fun accessories, jewelry, or sunglasses to complete your look. White, eyelet dresses are always a favorite of mine for the summer. When paired with navy or red, it can also have a patriotic look. I found this particular dress (similar here) from Banana Republic, and I loved the feminine flutter sleeve, as well as the skirt. I chose a cobalt, mini bag (similar here), and stacked several blue bracelets (similar here) to accessorize, as well as an “H” monogram, gold necklace. I finished my look with neutral, wedge Char Sandals.